Synthetic cannabis is a designer drug consisting of natural herbs sprayed with synthetic chemicals which when consumed are said to mimic the effects of cannabis. It is best known by the brand names K2 and Spice and Spice product. The test pack will also test for standard street Cannabis as well at test sensitivity of 20ng/mL. This drug test pack will test your urine for Marijuana (cannabis), K2/Spice (Synthetic Cannabis). Synthetic cannabis is a designer drug consisting of natural herbs sprayed with synthetic chemicals which when consumed are said to mimic the effects of cannabis. It is becoming more and more common especially amongst young people. It will not be detected by pure cannabis tests so this new test is vital if you want to find out if someone has taken any form of cannabis. Similarly, if you are checking yourself for cannabis use then this new test would be safer for you because a lot of people may not realize whether they have taken pure or synthetic cannabis so you will need to use this test to ensure you are clean. It is best known by the brand names K2, Spice and Spice product. For more information about synthetic cannabis click here. Cannabis is a natural substance from the cannabis (or marijuana) plant. Cannabis is also known as marijuana, skunk, draw, dope, puff, hash, pot, spliff, wacky backy or weed. Cannabis is the most commonly used drug among 11-25 year olds. We are now one of the largest suppliers of drug tests to customers throughout the world and our tests are used in treatment centres, hospitals and by medical professionals. 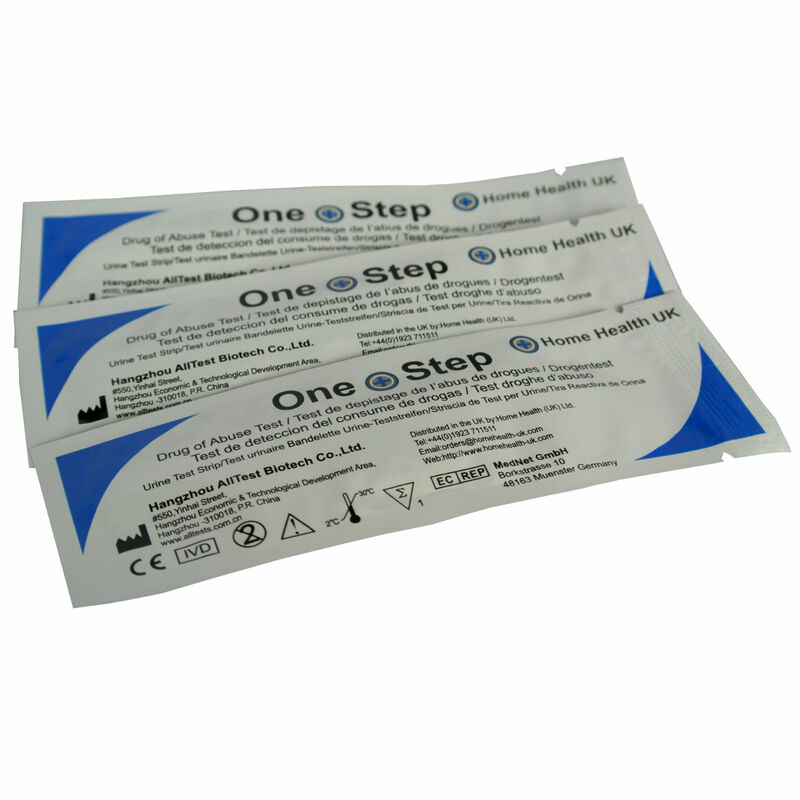 They are made specifically for us and comply with CE (European Community) and FDA (United States) rules and regulations and every pack has the approval details printed on them. We also supply large parts of the UK National Health Service (the NHS). The tests we supply to the NHS are identical to the ones we sell to you and every batch is checked religiously for quality and accuracy – they are more than 99% accurate. As for the expiry dates, they will always be at least 1 year away and more often nearly 2 years (which is the legal maximum). Unfortunately a lot of eBay sellers claim to be NHS suppliers when they are not. If you click on the above link you can search “drug tests” in the box at the top and all the NHS suppliers of drug tests will be displayed under “brand” at the top of the page. You will see us (Home Health UK) but you will struggle to find many other eBay sellers – we could not find any!! 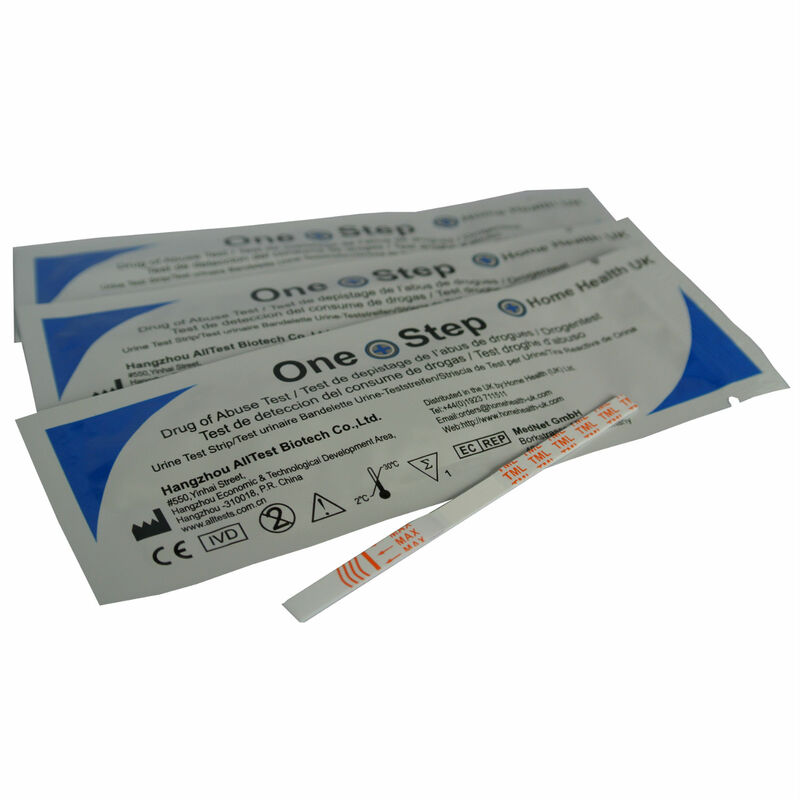 We sell drug-testing kits for all types of drugs and the kits are available with different testing strips for you to choose which drugs you want to be tested for. All of the drug tests are simple to use and only involve taking a sample of urine. Results are accurate and rapid (in 5 minutes). The following table may help you understand the different drugs, their proper names and street names as well as the approximate detection times in urine after using that drug. You will see 2 letters on the drugs test; ‘C’ this is the Control band and ‘T’ this is the Test band. A pink coloured line should appear on the strip of the control band (C), this confirms that the test is working properly. If no line appears in the control band the test hasn’t worked properly and you may need to do a further test. A second pink coloured line, no matter how faint should now appear in the test band (T), this is a negative result. If no further line appears in the test band (T) then the individual has tested positive for that drug of abuse.